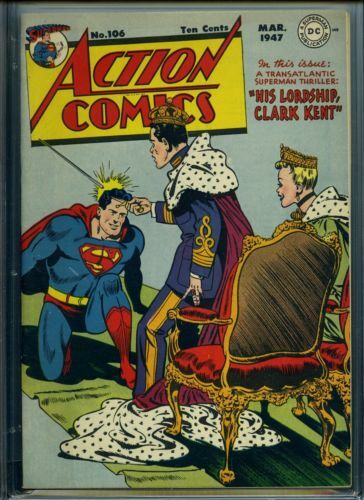 ACTION COMICS #106 - CGC - Superman - Tied highest graded! This very beautiful, unrestored copy is complete, fully readable and has both covers attached. The book has white pages, and features Superman. Condition is a very conservatively graded CGC-9.0, VFN-NM; this is tied for the highest graded copy. From the collection of Ron Pussell, longtime senior Overstreet Price Guide consultant. Please remember that Media Rate may take up to 4 weeks delivery.